August 22nd, 2014 | Moving Tips, Wheaton World Wide Moving. Entryways/Foyers/Mudrooms are the transitional areas for family members and visitors, bringing in, coats, shoes and of course clutter. Keeping the room clutter free makes it easier for transitioning from outside to inside. Entryways should not be used for long term storage; they should only be used for the things that come on and off when you enter of exit the house. Coats and jackets need to have a specific place to hang in the entryway to prevent clutter in other rooms in the house. When planning coat storage, be sure to take into account the room you’ll need for your family’s outerwear and for visitors’ coats. If you have an entryway closet, it should be dedicated to outwear. If the closet includes a shelf, use it for outerwear garment such as mittens and hats. You can add additional hooks on the back of the door for additional storage. If you do not have a closet in your entryway, a free standing piece of furniture such as a coat rack, hall tree or hooks and pegs can solve the issue of coat storage in that area. The process of keeping shoes organized begins with providing enough space for all the footwear in your entryway. Keep shoes on a mat or rack that is easy to clean. You can use a shoe rack or stackable shoe shelves to organize. Try to group by who wears the shoes. If you do not have room, store out of season shoes in a bedroom closet. Give keys and mail specific places in the entryway. Keys should have a precise place that does not change, so you will know where to find them at all times. You can use hooks, various key hangers or a bowl on a nearby surface to hold keys. Wall files are a viable option for mail organization. Another option If you have a table, use a bin or tray to keep the mail tidy. Remember to go through the mail frequently to avoid back log. Seasonal items are all those things used for different times of year. Multi-bin organizers are a great option for large families, allowing a bin per person to store items such as mittens, gloves, hats, etc. Add add a bin or basket to hold gardening items. Umbrellas should be stored standing up to allow drying and prevent damage. An umbrella stand is an option as well as a wire-mesh trash basket. 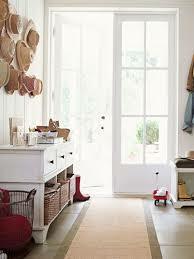 With enough hooks and other storage, entryways should stay orderly on their own because nobody spends much time there. Check the area periodically. Every week, make sure coats are hung in proper places. Rehang those that have fallen off of their hooks or hangers. When seasons change make sure that you move heavy jackets and boots to seasonal storage spaces. Every two or three days, check shoes and boots in the closet. Rearrange if necessary. Every Saturday, perform a mail check to see that nothing important was left in the area and that mail is being move to where it needs to go.